I just bought a tub of Sunshine Protein Powder, made by Designer Protein. I’ve used it in a few different smoothies and have researched the ingredients. Overall I am very happy with this vegan protein powder and would like purchase it again. Taste is the least important aspect of a protein powder. No one drinks protein shakes because they love the taste. You drink protein powder for the protein and nutritional value. That being said, the reason I am writing about taste before anything else is that it’s hard to enjoy a smoothie if it tastes like feet or rotten eggs. With the huge amount of different flavors our there, there is no reason to drink a disgusting protein shake. I bought the vanilla flavor. The thing that I notice most about it is how mild the flavor is. I’ve tried some protein powders in the past that were so overpowering that they couldn’t be used in a smoothie. They tasted like flavored sugar. Sunshine Protein doesn’t taste at all like sugar. It’s got a mild vanilla flavor that’s not too sweet. It’s got a little bit of an earthy flavor. This is due to the protein being plant based rather than whey. Sunshine Protein is great for smoothies because it does not overpower the fruit and other ingredients. With some of the smoothies that I made I didn’t even notice that there was a protein powder in there. I couldn’t ask for a better tasting protein powder. Not all protein powders are made with the same quality of ingredients and the same source of protein. The most obvious different of Sunshine Protein Powder is that it is made from 100% plant based protein. This protein powder is fully vegan. The protein sources in Sunshine’s brand include sunflower protein, pea protein, and pumpkin protein. One scoops contains 120 calories and 16g of protein. You also get 12g of carbs and 2g of fat. You also get some vitamins and minerals including over 20% of your daily Vitamin C, Iron, and Phosphorus. 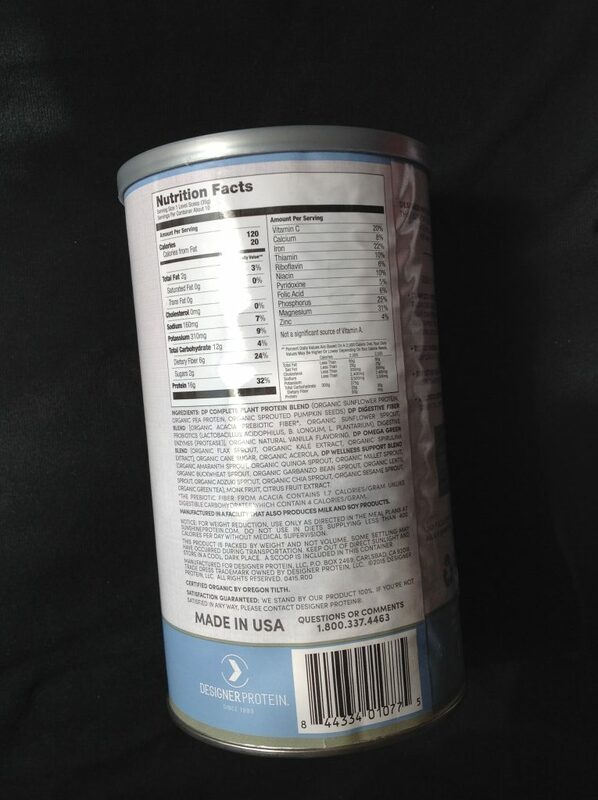 The Designer Protein Sunshine label is targeted at women. Though I am not a woman, I still enjoy it and will continue to use it. Though the company may be trying to increase certain nutrients that re especially important for women, everyone needs a good amount of Iron, etc. This protein powder is marketed for women, but is perfectly good for men. Besides protein, this powder includes a lot of other nutritional supplements that you might not get in your daily meals. This includes specific probiotics and digestive enzymes which help with digestion. There are also greens such as kale and spirulina in this powder. Not only do get get a good amount of protein, you are also getting supplements that many people consume independent of their protein powder that have general health benefits. Not only are you feeding your muscles, you are feeding your whole body. The Designer Protein Sunshine Protein Powder is gluten free, soy free, and vegan.